The term migration is used to designate various forms of movement: from one place to another, from one (social) group to another, from one society to another. A distinction can be made between migration for a limited period and migration on a permanent basis, and between migration as a voluntary act and migration as the result of coercion. About 11.5% of the people living in Austria today were born in another country. Most of them live in cities or near major industries. In rural areas like the Ötz Valley, the labour market is practically the sole determining factor for incoming migration. 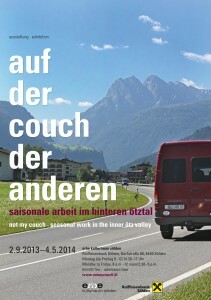 There are differences in the period of employment offered: Whereas mainly year-round employment is available in Längenfeld, for example, the tourism businesses in Sölden, Gurgl and Vent primarily need labour from other countries during the season; in March there are three and a half times more migrant work- ers in the inner Ötz Valley than in June.